I didn’t think I looked like a New Yorker—I don’t have the posh stylings of a Manhatten diva, nor do I have the big hair of a flashy girl from Queens. But I must have some look that screams “City Girl!” because, despite the iPod that was permanently embedded in my ear and my horrible hair thanks to the hair dryer I left sitting on my bathroom counter at home, four people stopped me to ask for directions. Yes, four. In two days. Maybe I just look approachable? Or maybe I walk with confidence? Really, I only knew where I was going because I was constantly referencing my new cell phone’s GPS feature—God bless you Verizon! My trip to New York City this weekend was all about books. Traveling alone meant I could actually sit in cafes and parks and write whenever I wanted, and I think I filled half a pocket notebook with the most random story ideas and research notes. I wanted some me-time to read a few of the books that have taken over my desk as well as make a quick (ha!) trip to my book Mecca—The Strand—because their book bags are the perfect size with the perfect give, but after four years of constant use and abuse, my old bag deserves a long, quiet retirement. Check out all the loot I got. Really, this trip was just a poorly veiled excuse to meet my online book buddy Lisa McMann. While there were tons of people at the Books of Wonder event, I did have a chance to actually talk to Lisa for a while. We’ve been exchanging book recommendations for years now (I can’t believe it’s actually been years), so I couldn’t pass up the chance to meet her in person. But after a couple weeks on tour, Lisa had been smiling so much it looked like it actually hurt. When I asked if we could get a picture, I told her smiling was not necessary. It’s too bad the first picture was so blurry, because we looked fierce. Only I’m not such a good actress, and I totally lost it for the second picture and ended up with crazy eyes. 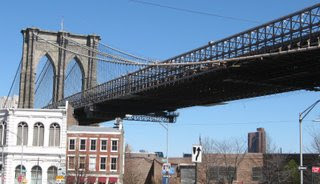 I also wanted to spend some time in Brooklyn on this trip. It is no secret that I’ve had a preoccupation with that borough since reading A Tree Grows in Brooklyn in high school. But my previous trips to NYC have been with people who don't share my odd little obsession. I have now eaten, shopped and explored a couple little corners of Brooklyn, complete with a hike across the Brooklyn Bridge. I am a happy tourist, I mean, just look at that bridge-blown hair and squinty eyes. Can't you just tell that I have wanted to walk across that bridge for ten years? I am such a nerd. I am SO jealous that you got to go to New York!! That is totally one of my destination cities that I will visit sometime, hopefully in not too long! I'm glad you were able to meet you book buddy and explore Brooklyn. I read A Tree Grows in Brooklyn just a few months ago, and I think it's fantastic! I might have told you that already and if I did, I apologize! It looks like it was a fun trip for you! You guys are too funny. I would love to take a trip with both of the to NYC. We'll have to plan that for next year.